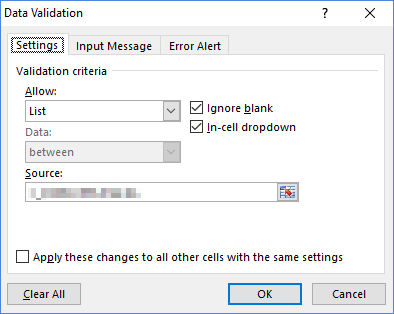 Although, in my case I knew which cells had data validation defined, there where too many of them to manually find the problematic one by checking them one by one. Then it occurred to me that the Excel workbook format is actually compressed XML which can be searched through with any descent text editor. I made a copy of the .xlsx file and changed its extension to .zip. I then decompressed its contents into a folder and used Visual Studio Code's Find in Files functionality to find the worksheet(s) containing the link to the missing file (the filename can be found in Excel's Edit Links dialog). It is enough to only search the XML files. I found it based on r:id attribute value. The name attribute contains the worksheet name as displayed in Excel. Now I could finally reopen the workbook in Excel, navigate to ActualName worksheet, and open the Data Validation dialog for the E13:E37 range of cells (as specified in the snippet from xl\worksheets\sheet15.xml above). After I changed the Source there, the Break Link command in Edit Links dialog succeeded as well - no more nagging dialogs every time I open the file.